Winners of the 2010 Sunburst Award for Canadian Literature of the Fantastic have been selected. 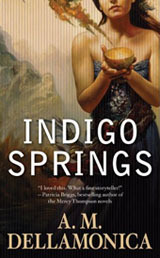 The adult award went to Indigo Springs by A. M. Dellamonica. 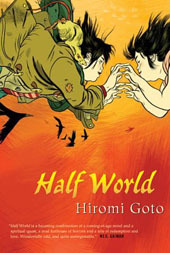 The young adult award winner was Half World by Hiromi Goto. Winners of the award named after a novel by Canadian author Phyllis Gotlieb (1926-2009), receive $1,000 and a medallion bearing the Sunburst logo, designed by Marcel Gagné. Jurors for the 2010 awards were Don Bassingthwaite, Gemma Files, Susie Moloney, Ursula Pflug and Edward Willett. Next year’s Sunburst Award jurors will be Julie Czerneda, Kate Freiman, Mark Leslie, Christopher Roden, and Alison Sinclair. The Sunburst Award for Canadian Literature of the Fantastic is a prized and juried award presented annually. It is based on excellence of writing and awarded to a Canadian writer who has published a speculative fiction novel or book-length collection any time during the previous calendar year. Named after the novel by Phyllis Gotlieb (1926-2009), one of the first published authors of contemporary Canadian speculative fiction, the award consists of a cash prize of $1,000 and a hand-crafted medallion which incorporates a “Sunburst” logo, designed by Marcel Gagné.